Broccoli (Brassica oleracea var. italica or botrytis), Brussels sprouts (Brassica oleracea var. gemmifera) and cauliflower (Brassica oleracea var. botrytis) are also widely consumed varieties of Brassica oleracea. As these varieties have probably been bred in the last 300-400 years, they are likely to have similar immunological properties. However, there is some possibility of variation because different parts of these plant foods are consumed (flower heads for broccoli and cauliflower versus leaves for cabbage) and cabbage is sometimes eaten raw whilst the others are generally cooked. This is also true for mustard where the allergens have been characterised from the seeds but the seeds have different composition to the leaves. Symptoms:Blaiss et al. (1987)  reported a single case study of a 21 year-old female with pain and swelling in mouth and throat with difficult breathing, but without a drop in blood pressure, urticaria or wheezing, after dinners (at a 2 week interval) including coleslaw. She had been a patient in the past with allergic rhinitis to numerous inhalant allergens (i.e. grasses, moulds, ragweed and dust mite). She had received immunotherapy to grass and dust allergens but stopped 1 year prior to reaction to cabbage. Total IgE was 31 IU/ml. Commercial extracts and undiluted raw cabbage extract, i.e. homogenate of fresh cabbage leaves in 0.01M PBS (pH 7.2) (2:1, w/w), centrifuged, supernatant dialysed and concentrated (Amicon YM2 MW exclusion 2,000). Protocol: (controls, definition of positive etc)Multitest, prickpuncture method (Lincoln Diagostic, Decatur, IL) with commercial food extract (1:10 w/v prepared by Hollister-Stier, Spokane, WA) and undiluted raw cabbage extract. The tests were graded by the method of Aas et al. (1978)  with histamine 3+ and diluent (zero). Number of Patients:Blaiss et al. (1987)  report SPT on a single patient. Summary of Results:Blaiss et al. (1987)  report a positive SPT 4+ reaction to cabbage (commercial extract), mustard and cauliflower, 3+ to broccoli and raw cabbage extract, no reactions to fish, shellfish or chicken (foods eaten with the coleslaw). Food/Type of allergen:Undiluted raw cabbage extract, i.e. homogenate of fresh cabbage leaves in 0.01M PBS (pH 7.2) (2:1, w/w), centrifuged, supernatant dialysed and concentrated (Amicon YM2 MW exclusion 2,000). Number of Patients:Blaiss et al. (1987)  report on serum IgE binding from one patient. Summary of Results:Total IgE was 31 IU/ml by ELISA and no evidence of elevated levels of other classes of serum antibodies (IgG, IgA and IgM) to cabbage were found in patient's serum. The patients serum gave a RAST ratio of 36 to control serum with cabbage extract. The very close botanical relationship of cabbage, brocoli, Brussel sprouts and califlower (all classified as varieties of Brassica oleracea) suggests that these contain very similar allergens. This agrees with the SPT data of Blaiss et al. (1987)  and Panconesi et al. (1980)  although no IgE inhibition studies have been reported. Blaiss et al. (1987)  did not use immunoblots but used gel filtration fractions of the raw cabbage extract prepared using a BioGel A column (0.5m) calibrated with 2,000,000 to 13,930 Daltons standards. The column was equilibrated with phosphate buffered saline (10 mM, pH 7.2). Allergens binding IgE from the patients sera were found over a broad range of molecular mass by RAST. One polypeptide ran between 67 kDa and 45 kDa and a more strongly binding polypeptide ran at >45 kDa. A 28-year old woman developed itching on contact with several vegetables and had a positive scratch test to cabbage (Calnan, 1981 ). Chakrabarti et al. (2003)  describe contact dermatitis to broccoli with a positive patch test and Van Ketel (1975)  described contact allergy to cauliflower. Occupational dermatitis to cabbage was reported by Leoni & Cogo (1964) . Contact urticaria from cabbage (brassica). 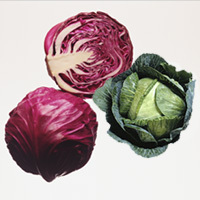 Anaphylaxis to cabbage: detection of allergens. Aas K, Backman A, Belin L, Weeke B. Standardization of allergen extracts with appropriate methods. The combined use of skin prick testing and radio-allergosorbent tests. [OCCUPATIONAL DERMATITIS DUE TO CONTACT WITH CABBAGE.] Italian. Chakrabarti A, Prais L, Foulds IS. Allergic contact dermatitis to broccoli.